Building on my last post, I’ve been on a little bit of a tea-kick. David’s Tea Cream of Earl Grey is one of my favourites, and incorporating it into some of my favourite recipes has been a unique challenge. I modified my vanilla cupcake recipe I’ve been using for nearly 10 years to add the strong earl grey flavour, giving these cupcakes a unique depth. It took a few tries until this experiment was a success! 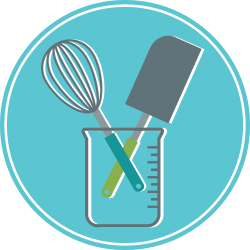 After all, this is why we chose to call this blog The Science of Baking. 2) Add the flours, sugar, baking powder and salt. Mix on medium speed until well combined (about a minute). 3) Add margarine, a few cubes at a time until mixture resembles coarse sand. 5) Slowly pour in almond milk, vanilla and earl grey concentrate. Beat for 2 minutes until smooth (works best with a mixer), scraping sides of bowl as needed. 6) Fill liners 2/3 full (about 1/4 cup batter) and bake for 15-20 minutes until tops are golden brown and centre is set. 7) Make the Frosting: Cream margarine. Add vanilla and gradually add sugar, scraping the sides of the bowl as necessary. Add almond milk and beat until fluffy. If desired, add food colouring. Makes 24 cupcakes. These freeze well unfrosted in a ziploc style bag. As well, the batter can be made in a 9 x 13 sheet pan (bake for 35-45 mins) or 9-inch circular pans (bake 25-35 mins) to make a cake. Similar to our friends the blueberries, Pure Vanilla Extract is rich in anti-oxidants such as vanillin. Using imitation vanilla decreases the anti-oxidant quantity, and therefore decreases potential health benefits. Vanilla has been shown to be anti-oxidant, anti-inflammatory,and anti-bacterial. As a result, it may reduce one’s risk of certain cancers.